NOTE: This tag and series is NOT FOR SALE, PROFIT, OR COMMERCIAL USE. This is where the JMC craze started. This was the very first one. Now look where we are - close to, if not over, 300 different JMC's made. Never in my wildest dreams would I have thought it would have gone this far. Here we go!! 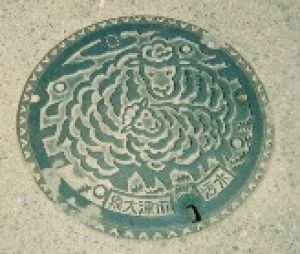 After getting positive input on the forums, I've started my Japan Manhole series. This is #1 - Izumi. This one is located in the area I lived and worked for two years. Ran over it everyday on the way to work on my bike. Brings back some very fond memories of the Best Years of My Life. The city fathers describe Izumiotsu this way: "Izumiotsu is like a gemstone - small, yet packed with dazzling beauty...." Even though it sits very near Osaka metro complex, it retains a measure of individuality and a strong sense of pride. During the Edo period, Izumiotsu became a major producer of cotton. Since that time it has become a major textile center specializing in the manufacture of knitwear and blankets. Hope you will enjoy this series as it grows and grows and GROWS!! AND, that you will occasionally "look down" - you may be surprised at what you see. Many Thanks to Joebids for helping me get my designs into tags!